LiquidPoker - PartyPoker – free PlayStation 4 and tickets worth $22 for new players! PartyPoker – free PlayStation 4 and tickets worth $22 for new players! If you are thinking about starting your adventure with PartyPoker, then we have some great news for you. 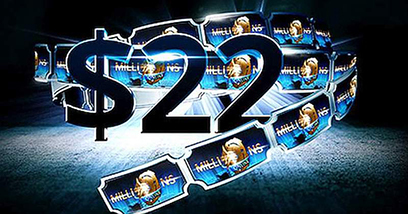 PartyPoker wants to help new players and offers them $22 tickets totally for free! The operator decided to modify its offer. Now all new players can get as many as four tickets – each worth $5.50 which means $22 in free tickets that you can use in qualifiers! Tickets that you receive can be used in satellites to MILLIONS Online. It's a huge series that will take place between November 25th and December 5th. Its record prize pool will amount to as much as $20,000,000. This is very simple. All you need to do is create an account at PartyPoker using this link, and then deposit at least $10. You will automatically receive four tickets worth $5.50 each. How you use them is up to you! – The best rakeback system on the market (details under this link.